Ballymacoda Estuary is a large estuary on the east Cork coastline where I have been birdwatching for many years. More recently I have made it an occasional habit of taking my dogs for a walk in the evening to Ring Strand, one access point to the estuary and just ten minutes from my house. On 29th July 2013 that was exactly what my wife and I decided to do. We parked the car and commenced our walk out the long curving beach. I always carry my binoculars with me on these walks and it has paid off occasionally as I have found several rarities such as American Golden Plover Pluvialis dominica, White-rumped Sandpiper Calidris fuscicollis and Little Ringed Plover Charadrius dubius on the walk. After about fifteen minutes we had reached the end of the beach where the wader flocks tend to gather at high tide, I looked through the near flock that consisted of Dunlin Calidris alpina but found nothing unusual. Behind them was a large Ringed Plover Charadrius hiaticula flock that I scanned through slowly, and I was utterly shocked to come upon a summer plumaged sand plover. The bird was several hundred metres away and I only had binoculars, there was no possibility of getting closer as the birds would all flush so I had to be very content to watch from a distance. I rang Paul Moore and Alec Jeffrey who were the nearest birders and continued to watch the bird for another fifteen minutes until the whole flock got up for no obvious reason, circled, and landed again but the sand plover was no longer present. There was a strong possibility that it had flown across the dividing channel to Pilmore Strand, which would be a good 20 to 25 minute journey for me to get across to. 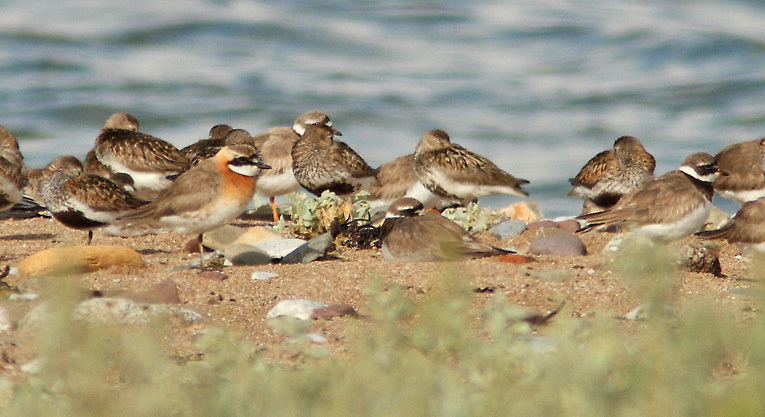 Having spoken to Killian Mullarney I suspected the bird might be a Lesser Sand Plover Anarhynchus mongolus. No sand plover species had ever been recorded in Ireland previously so whatever it was it would be a first. The combination of the birds relatively small size and full summer plumage as well as a record of the nominate mongolus race in Scotland about a week before made me think that it could be a Lesser Sand Plover and perhaps even the same individual. Paul and Alec went straight to Pilmore and about 30 minutes later Paul rang me back with the words 'You've found a Mongolian Lesser Sand Plover'. The two lads had refound the bird at the high tide roost and been able to confirm all the features. The bird disappeared again from there so I stayed at the Ring side of the estuary to search. A small crowd of about fifteen birders began to gather at Pilmore and the bird was relocated there but at this stage it was too late for me to get around so I had to be satisfied with my initial binocular views for that night. The following morning the bird reappeared before the high tide again to the great relief of the large crowd of Irish birders present, indeed this seems to have been one of the largest gatherings of Irish birders in one place in recent years. The bird was present on the estuary to early evening, but was quite mobile at times, it was not seen thereafter. Illustrating the changing nature of birding in the field, people were able to compare photographs of the bird in Scotland on phones with back of the camera shots of the Cork bird as it roosted in front of them, these confirmed that they were one and the same bird; a remarkable relocation! Size and structure: Slightly larger than Ringed Plover with longer legs. Bill not overly long, though some columbinus Greaters may not necessarily appear long-billed (when compared with taxa such as crassirostris, say). Not as short as seen in atrifrons group Lesser, however. 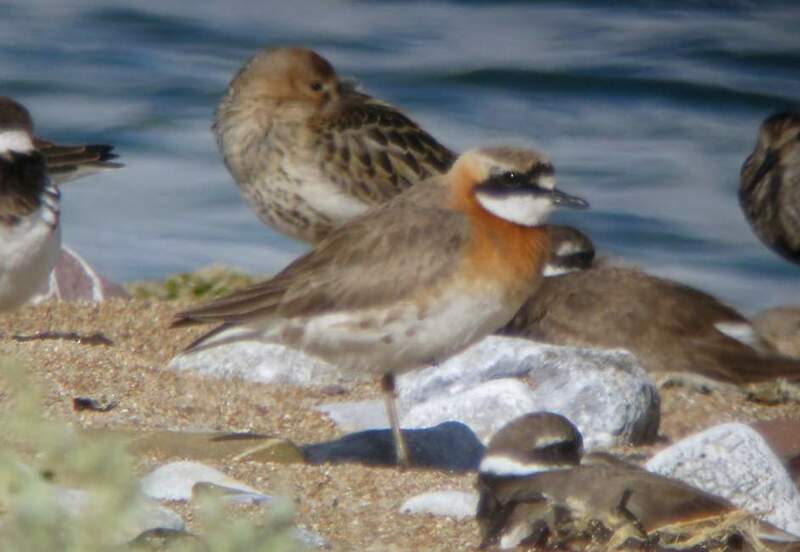 General plumage: Given the late July date, the fact that the bird was more or less in full breeding plumage was a strong indicator that this wasn't a Greater Sand Plover Charadrius leschenaultii, as that species is known to moult out of breeding plumage quite early in the season. Head: Large extent of white on the forehead, excluding a Lesser Sand Plover of the atrifrons group. No complete black dividing line bisecting the forehead patch, as is typically shown by Greater Sand Plover in the same plumage, but a very narrow and incomplete black line was present. Black on lores and ear coverts, with a black line across the forecrown connecting the black on either side of the head. The nape was pale, appearing a more washed-out version of the breast colour, and isolating the browner crown to produce a capped effect. Underparts: Throat white, narrow black line seperating the throat from the red-orange breast. The upper breast was a touch richer, more brick-red toned, than the more orange tones prevalent on the lower breast and onto the flanks, with some orange tones also extending almost to the nape along the neck sides. 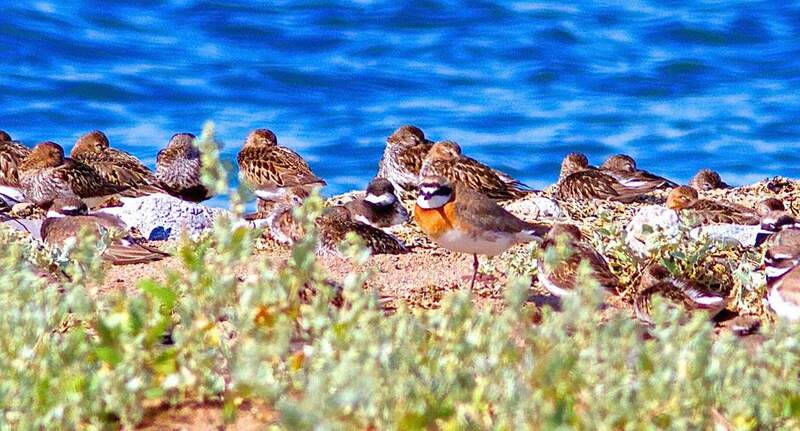 There were some vaguely orange markings on the upper flanks, with a scattering of grey-brown feathers also on the flanks, a feature presently considered diagnostic of the mongolus group of Lesser Sand Plover ('Mongolian Plover'). Belly, vent and so on white. Upperparts: Reasonably dark grey-brown above, with greyer tones on the coverts, not as sandy-toned as could be expected on an atrifrons group Lesser. Bare parts: Bill blackish. Legs olive-grey. A selection of pictures taken on the 28th July 2013. Click on the thumbnail for larger images. Aidan G. Kelly took a short video of the bird, which is available to view on YouTube. 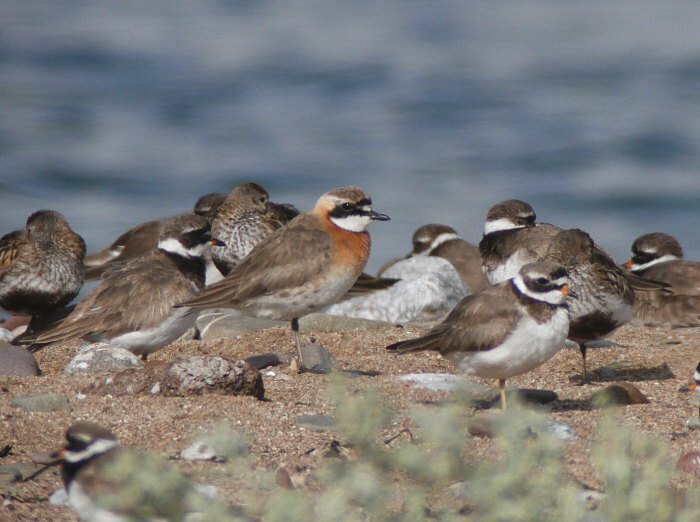 While a record of a sand plover species had long been awaited in Ireland, it could be argued that Greater Sand Plover had been the more expected species, borne out by the much greater prevalence of records of this species in Europe compared to Lesser Sand Plover (both groups combined). However, a few recent records in Britain have referred to Lesser Sand Plover, so this occurrence wasn't too much out of left field. The timing fits with a summer/early autumn peak for Lesser Sand Plover in western Europe (or, indeed, sand plovers in general). Given the presence of a mongolus Lesser Sand Plover at Lossiemouth, Moray (Scotland) on 16th July, it was wondered whether the same individual bird could have been involved in both sightings. The exact nature of the flank markings, the worn coverts and a small dark smudgy area above the ear coverts seen in images from both locations establish that, yes, the same bird was involved, showing just how much some individual vagrants may wander around once they reach western Europe. Lesser Sand Plover is a polytypic species of plover with five races that form two distinct groups; the far-eastern Russia pair of mongolus and stegmanni (these two larger forms are sometimes treated as a full species Mongolian Plover) and the central Asian atrifrons, pamirensis and schaeferi. 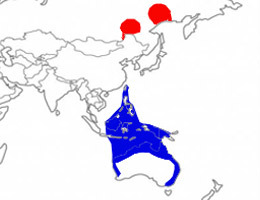 Nominate mongolus breeds in inland eastern Siberia (Lake Baikal east to Amurland) and far-eastern Russia in the vicinity of the Verkhoyansk Mountain range, wintering from Taiwan south through Wallacea to Australia. In the Western Palearctic it is a rare but regular passage migrant in the Levant and passage migrant and winter visitor in Kuwait. Elsewhere in the WP it is a very rare vagrant usually in June and July. To date there have been six British records since the first in 1991.